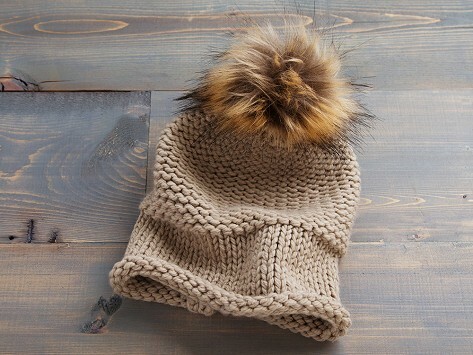 Stay warm and in style—this slouchy knit hat has a faux fur pom pom that adds a trendy touch to your outfit. Each Lizette is designed to sit at the crown of your head while keeping your ears warm. Dimensions: 7" D x 12"
The hat is as pretty in person as in the photo. It fits well too. Snuggles for the Top !! I love this hat, but it's very tight on my head...I'm hoping it will stretch. Topped with a faux fur pom pom, this slouchy knit hat will keep you feeling warm and stylish through the seasons. Maker Lizette Hidary knit the first model for her daughters when they couldn’t find a hat they liked to wear. Her design is tightly knit at the bottom, letting it sit on the crown of your head with enough yarn to create a casual cascade. Wear it in or out—the plush pom pom adds a trendy touch to virtually any outfit.